However, Al Shaheen had survived the winter months exceedingly well, thanks to all the care and attention lavished on her, both prior to us leaving and after we’d left. We were very fortunate in having a great friend in Mike Mulrooney who took her under his wings and checked on her regularly. He opened up big holes in the shrink wrap as the weather warmed up, which meant she stayed dry – no mould or mildew – thanks Mike! 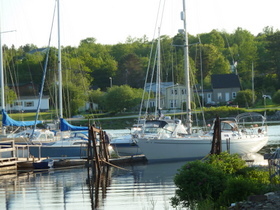 The yard here at Gold River Marina have been really great, with Cindy and Darrin going the extra mile on a daily basis. 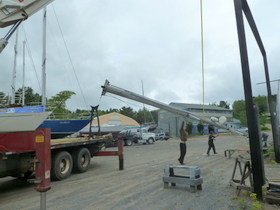 Putting the mast back in was a breeze (although we did get the forestays back to front for about five seconds – fortunately hadn’t finished screwing them down when we noticed the mistake!! ), and by Thursday afternoon we were back in the water – only a few inches under the keel, but we were afloat! Then of course the work really started. 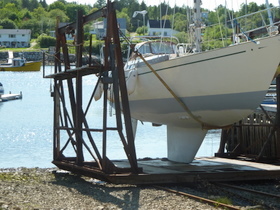 I never fail to be amazed at just how much work there is in putting a boat back together again! 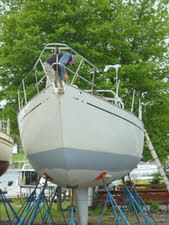 Every halyard has to be rethreaded back up the mast, every sheet put in place and tied off, to where it belongs, the sails have to be bent on, the electrics re-connected, all the instrumentation redone, all the stuff at the top of the mast refitted. Not to mention the re-provisioning – boy, we maxed out the credit cards quite early on restocking the boat with food for a couple months! But finally it’s done, and we’re now ready to take off. The fog has just lifted, it’s not raining – there’s no wind, but what the hell, we need to do a shake-down engine run to make sure no knobs fall off anyway! And we do need to get out of here now – we’re growing barnacles from all the social activities we’ve been indulging in. Chatting the other night, John and I were agreeing that it looks like we’ll be sailing over this side of the Pond for a while yet – most of our sailing friends are here! So, watch this space – we’re on our way North! It’s always nerve-racking coming back to the boat after 9 months away, and this time was no different. 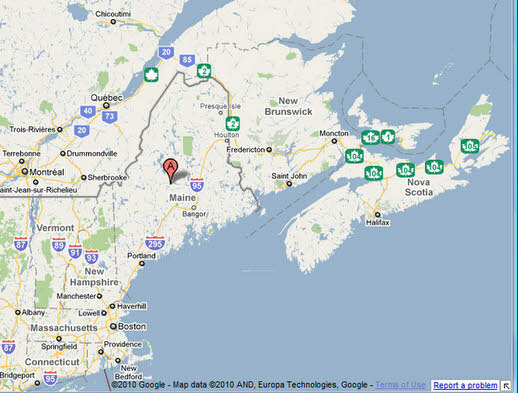 Well, perhaps slightly different – we both found it took a bit longer to make the adjustment from major land travel and driving down West Africa to the potential of major sea travel and sailing up the Eastern shores of Nova Scotia and Newfoundland. Heat and gorillas versus icebergs and polar bears?? ?